In his classic cross-cultural studies, Irenäus Eibl-Eibesfeldt, father of human ethology (the study of the biological basis of behavior), documented laughter’s universality. To do so, he devised a curious and effective method of filming people in natural settings without affecting their behavior. He attached an optical prism to the camera’s lens so that he could photograph people who were at right angles to the direction in which he pointed it, catching them unaware. With this technique he filmed the social interactions and facial expressions of thousands of individuals: Brazilian Indians, African tribesmen, Greek fishermen, British businessmen. In every culture that he investigated, all people laughed: in surprise, wonderment, embarrassment, and discomfort—not necessarily, or even frequently, in amusement. Do we learn to laugh? Or is laughter innate in human beings, an ability hardwired into our brains? That laughter is present in all cultures, even tribes wholly isolated from all others, is not firm evidence that it is innate. Even an infant who laughs could be imitating a parent’s laughter. I believe, however, the evidence points to an innate, preprogrammed basis for laughter. Studies of congenitally blind, deaf, and dumb children, for example, proved that they could smile and laugh when tickled or caressed, even though they were unable to imitate other people. If laughter is innate, there might be evidence for it in the evolutionary record. We cannot know whether primitive Homo sapiens—or our predecessor hominids on the African plain—laughed as we do, but by observing the primates closest to humans we see that laughter is not unique to ourselves. If we are but one among many social species, after all, why should we have a monopoly on laughter as a social tool? Playful behavior is virtually universal among mammals. Scientists investigating the biological basis of this behavior propose that play in animals is essential for learning and forging social bonds. It is not “real” behavior; it is a kind of rehearsal of serious social interactions to come. In many cases, playful behavior prepares for adult aggressive behavior—and how to cope with it. Scientists have known for a century that the great apes, such as chimpanzees, display something similar to human laughter. They open their mouths wide, expose their teeth, retract the corners of their lips, and emit loud and repetitive vocalizations, much like ha! ha! ha! Chimps laugh in situations that tend to evoke human laughter, for example, when playing with one another or with humans, or when tickled. We laugh only when tickled by someone else. This curious beginning of bonding between parent and child intrigued Charles Darwin, who first observerd that for tickling to be effective we must not know in advance precisaly where it will occur. Laughter may even have evolved long before primates appeared on the scene. 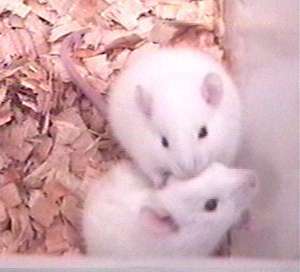 When tickled, rats emit vocalizations that could be interpreted as laughter.3 Neurobiologist Jaak Panksepp found that juvenile rats emit short, high-frequency, ultrasonic vocalizations during rough-and-tumble play.4 They “laugh” more often than older rats do, which Panksepp sees as consonant with the observation that human children are more ticklish than adults. Animals may not have a sense of humor, which I will argue is uniquely human, but they do have a sense of fun. Panksepp suggests that rats and primates, especially juveniles, use laughter to distinguish playful from threatening physical interactions. We watch puppies tumble over each other, snarl, and pretend to bite or give chase. To us, they clearly are having fun with this make-believe fighting, but subtle modifications of behavior, including vocalizations, signal to their partners that the fight is not serious. A puppy’s inability to signal (because of a damaged brain or having been raised in isolation) leads to serious fighting. Children of all ages—and, in many cultures, fathers and sons—also engage in rough-and-tumble play, with pretend punching and boxing and much accompanying laughter. Perhaps this is when we learn how to use laughter to indicate that aggressive play is just in fun. As a consequence, positive emotional bonds form among siblings and between parents and children. Not coincidentally, teeth baring in primate displays of aggression and in laughter are similar. Small variations in the position of the lips and in the accompanying sounds differentiate the two displays. Is this a clue to a common neural and evolutionary origin of laughter and aggression? Laughing in potentially aggressive or competitive situations disarms our social companions. 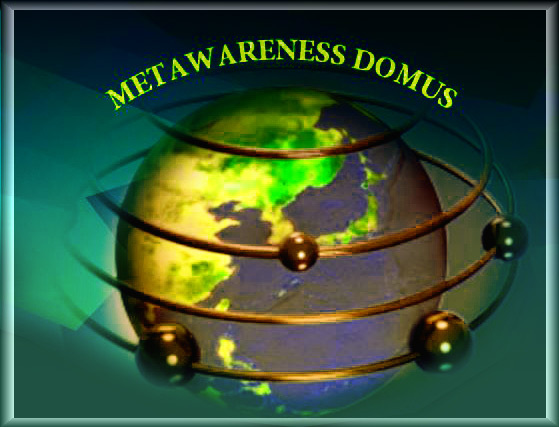 On the verge of becoming our adversaries, they pick up from our laughter that the situation is not threatening. In English, play refers not only to sport or children’s games but to acting a role on stage or in a movie. Play is a multifunctional concept applying to situations that involve laughter and make-believe. I hypothesize that human laughter has evolved culturally into a kind of “displaced behavior,” the term used by ethologists for animal behaviors that appear to be out of context—for example, birds that pretend to peck things on the ground when they are threatened by another bird. Laughter may have its biological origin in warding off aggression and offsetting nervousness in the face of a threatening situation, but the amazing social capacity of Homo sapiens has led to its use as a general tool in many situations, as well as a pleasurable behavior in its own right. In many species with complex social structures, play extends into adult life. For human beings, widely accepted forms of play such as games and sports are essential for social cohesion. Have you noticed how television sports commentators laugh and banter with each other? Adult play and laughter are indissoluble. You do not usually see such behavior, for example, with the commentators on economic news. Scientists have been studying the play behavior of young animals to identify its neural basis. Some are also evaluating whether and to what extent early social experiences such as play or lack of it influence neural structure and function. Although the neural bases of laughter are not fully understood, we are slowly putting together a picture of the various brain regions involved in producing laughter. The ancient limbic system of the brain, including two structures involved with emotions - the hippocampus and the amygdala - is involved in laughter, suggesting that it is deep in our animal nture. But our cortex, too, appears to have a role, relating laughter and speech and bringing humor into the equation. A. Primitive brain (archipallium) - Self preservation, aggression. B. Intermediate brain (paleopallium) - Limbic system, emotions. C. Rational brain (neopallium) - Neocortex, intellectual tasks. The evolving human brain acquired three major parts that developed in succession and became superimposed (see illustration above). The archipallium, or primitive (reptilian) brain comprises the structures of the brain stem; the paleopallium, or intermediate (old mammalian) brain comprises the structures of the limbic system. The neopallium, also known as the superior or rational (new mammalian) brain, includes almost the whole of the hemispheres (made of a more recent type of tissue called the neocortex) and some subcortical neuronal groups. These three make up the brain of the superior mammals, including primates and humans. When we examine brain areas involved with laughter, the limbic system (part of the old mammalian brain) seems central. It controls behaviors essential to the survival of all mammals—for example, defending oneself and finding food. 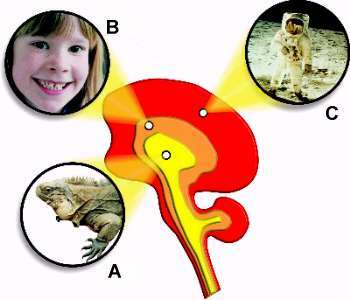 The same structures that are found in the human limbic system are found in the brains of much earlier animals such as lizards, snakes, and toads. In them, the limbic system, linked to the sense of smell, is involved in hunting, eating prey, and defending territory. In humans, the limbic system is more important in motivation and emotional behaviors. Two limbic structures involved with emotions are the hippocampus (a seahorse-shaped structure) and the amygdala, a small, almond-shaped structure deep in the brain. The amygdala connects with the hippocampus and the medial dorsal nucleus of the thalamus, enabling the amygdala to have an important role in mediating and controlling mood expression and emotion-laden activities like friendship, love, and affection. The hypothalamus, particularly its median part, has been identified as a key contributor to the production of loud, uncontrollable laughter. If laughter is such a primitive feature of the human primate, with origins in lower mammals, it stands to reason that its neural substrate would be in areas of the brain we share with other animals, probably the same places aggressive and emotional behaviors are organized. Recently, however, scientists have discovered that the brain’s cortex also plays a critical role in creating laughter. Studying a young epileptic woman, researchers electrically stimulated a part of the cortex called the supplemental motor area (SMA), and found that low-intensity current induced her to smile (5). A higher-intensity current transformed her smile into a contagious fit of laughter. The SMA, associated with the control of speech, lies just behind the pre-supplemental motor area, which is also found in nonhuman primates. Neurophysiologists believe that the SMA is part of a larger brain circuit responsible for processing emotions related to humorous things: the cognitive part (“getting it”) as well as the motor part (smiling and laughing), which involves muscles of the face and respiratory system. Based on those observations, researchers conclude that there is a link among the motor, emotional, and cognitive components of laughter. They propose that the SMA spot they found “is part of a further development in humans to accommodate the specialized functions of speech, manual dexterity and laughter.” So, not surprisingly, there is a relationship in the brain between speech and laughter. After all, both are communicative activities, for which we use the same muscles of the face and need to control the way we breathe. Primates have highly mobile facial expressions, and we rely on our faces more than any other body part for communication, including speech. Courtesy of Susan Blackmore Tickling is a fascinating instance of the connection between playfulness and social bonding. 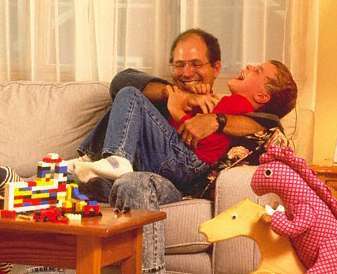 It begins in early infancy, when parents tickle their babies to evoke laughter and pleasurable sensations in them. Although there are a few “unticklish” children and adults, tickling almost always produces laughter. Probably tickling and laughter evolved in part to help us relate to others. One remarkable feature of tickling is that we do not laugh when we tickle ourselves, only when other people tickle us. 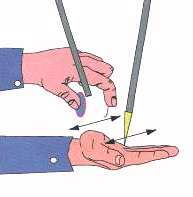 This implies that the brain may have a different mechanism for responding to the two types of tickling. Charles Darwin first explored the link between tickling and social relations, arguing that tickling provokes laughter through the anticipation of pleasure. If a stranger tickles a child without any preliminaries, catching the child by surprise, the likely result will be not laughter but withdrawal and displeasure. Darwin also noticed that for tickling to be effective, you must not know the precise point of stimulation in advance. He reasoned that this is why you cannot effectively tickle yourself. Researcher Sarah-Jayne Blakemore confirmed Darwin’s propositions by investigating how the brain distinguishes between sensations we create for ourselves and sensations others create for us. She used robotic arms to tickle people and found them to be as effective as real people in provoking laughter. When her subjects used a joystick to control the tickling robot, however, they couldn’t make themselves laugh.6 Her studies suggest that when you try to tickle yourself, your cerebellum sends to your somatosensory cortex precise information on the position of the tickling target and therefore what sensation to expect. Apparently some cortical mechanism then decreases or inhibits the tickling sensation. Why is the brain built this way? “It may be that there is no point laughing to your own tickle because it is not biologically important,” says Blakemore. But tickling by your playful companions is indeed socially important, as we have seen. From these studies an apparent contradiction arises. If laughter can be triggered by stimulating highly developed cortical areas of the brain, how could laughter be, at the same time, a primitive feature of both human and nonhuman brains? The answer may lie in our prodigious human capacity for humor, which we do not seem to share with other animals. The main argument here is that laughter induced by a joke or by watching something funny may be a highly evolved version of the laughter induced in our ancestors by play or tickling. Provine suggests that the human brain is able to enlarge the capabilities of one of its ancient, more primitive features by processing lower functions. in higher areas. “When we hear laughter, we are hearing something that is very primitive. In the more modern version, laughter induced by jokes involves cognitive systems, something that evolved long after speech and language.” Chimpanzees show laughterlike behavior in response to physical contact, such as wrestling, chasing, or tickling, but humans laugh more in response to conversational and visual stimuli. Both Darwin and German evolutionist Ernst Haeckel theorized that jokes were essentially “psychological tickling.” Haeckel believed that laughter was a kind of reflex, which relieved the irritation of vasomotor nerves brought on by physical or mental tickling. Ethnologist Glenn E. Weisfeld, an expert on humor, adds that “the subject matter of humor often pertains to ticklish situations.” The word humor is from the Latin humere, meaning “liquid” or “fluid,” and betrays the Aristotelian belief (continued into the Middle Ages) that all emotional states were related to the essential four body fluids that drive us. One definition of humor is “the mental faculty of discovering, expressing, or appreciating the ludicrous or absurdly incongruous.” Visual and verbal jokes often emphasize the exaggeration, absurdity, eccentricity, or inconsistency of a situation, a behavior, or an outcome. This exaggeration becomes the core element provoking laughter: the punch line. 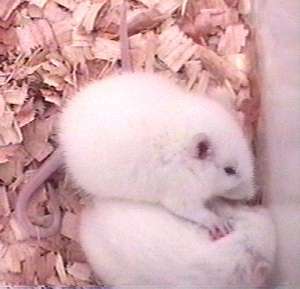 Rat pups emit short, high frequency, ultrasonic vocalizations during rough and tumble play, and when tickled. They "laugh" far more than olders rats. Another key element of humor and laughter is the release after danger and surprise. When we laugh our heads off at someone slipping on a banana peel or getting a pie in the face, we are laughing at situations that involve surprise, incongruence, potential damage to the body, or an unexpected outcome—all stimuli that trigger fight-or-flight in our primitive, jungle-primate selves. Philosopher John Morreall believes that human laughter may have its biological origins as a kind of shared expression of relief at the passing of danger. The relaxation of tension we feel after laughing may help inhibit the fight-or-flight response, making laughter a behavioral sign of trust in one’s companions. This connection between humor and the release of tension makes sense in brain terms. Animal (and human) brains do not like novelty and change; they are hardwired to produce a certain amount of tension when something unexpected occurs, because any environmental change could be a threat. A sudden noise startles us. A playful lunge at our belly by a friend provokes instinctive recoil and a suitably scared expression, then laughter. If the stimulus were a gunshot, however, or a real punch in the gut, we would most assuredly not laugh but seek cover or defend ourselves. Watch people laughing at an amusement park and you see this connection between release from danger and laughter. A boat swooping down a steep chute into water first evokes expressions of horror and fear. When no danger ensues, laughter erupts. 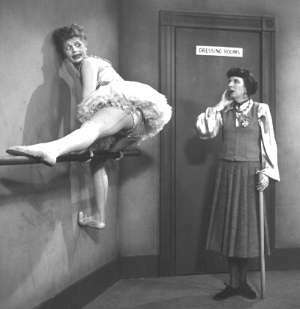 In the same vein, slapstick comedies feature a lot of head banging, falls, and edge-of-the-cliff situations to induce laughter. We enjoy make-believe aggression and danger and we laugh to relieve the tension and signal to our companions that all is well. Weisfeld notes that “lots of humor pertains to aggressive or competitive situations in which someone gets hurt.” See how professional comedians or clowns use stooges who are constantly embarrassed, hit, and harassed. 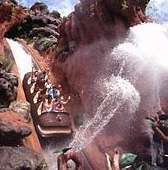 Release from danger or threat - or the civilized substitute for it during the amusement park plunge down the water chute - is followed by an explosion of laughter as we share our feelings of relief. The brain’s right hemisphere appears to be important in appreciating humor (7). In particular, the frontal lobe processes cognitive tasks needed for us to get to the joke, including abstract interpretation of aspects of conversation such as irony, affective intonation, sarcasm, and innuendo.8 The frontal lobe is part of a wider neural circuit involved in controlling emotion. Many neural pathways connect it with the “emotional” part of the brain—that is, the limbic and hypothalamic systems. is critical for the retrieval of memories. Serious research is showing that this notion is true. Laughter and humor decrease stress and anxiety, reinforce immunity, relax muscle tension, and decrease blood pressure and pain. Modern medicine is beginning to take advantage of these positive effects; hospitalized children who see clown shows have shorter hospital stays than those who do not. Laughter in humans serves as social glue. It helps us break the ice, get closer to people, dampen hostility and aggression, or soften a refusal. Laughter may also produce beneficial hormonal changes. Scientists speculate that laughter releases neurochemical transmitters called “endorphins,” which reduce sensitivity to pain and boost endurance and pleasurable sensations. Why does laughter have such pervasive power in our lives? Beyond its physical effects, I believe that the answer lies in our social nature. Laughter appears to be a basic aspect of bonding. We are creatures who need to build stable social structures to live well. Thus we need to enjoy peaceful relations with the people around us. Laughter is a kind of message we send to communicate this joyful disposition and a willingness to play. We rarely laugh when we are alone. We even feel that someone laughing alone may be crazy. Laughter has many subtle effects on our social companions. It breaks the ice, achieves closeness, bonds us, generates goodwill, and dampens hostility and aggression. Observe how we laugh when we want to deflate tension between strangers or need to say no to someone. We often laugh when we apologize. Laughter disarms people, creates a bridge between them, and facilitates amicable behavior. Even babies laugh. Since they are too young to have a sense of humor, smiling and laughing must reinforce their connections with their parents and others close to them. Laughter’s function in social relations may go still deeper. Studies have shown that socially dominant individuals like bosses or tribal chiefs use laughter to control their subordinates. When the boss laughs, everyone laughs. Is laughter, then, a form of asserting power? Morreall speculates that in this way, bosses are “controlling the emotional climate of the group.” Provine and his colleagues observed that women in an audience laugh more often when the speaker is a man. Does this suggest gender differences in how we use laughter? Or reflect men’s generally more powerful social role? Age differences in laughter have also been noted. Adolescents use it more when they are playing or flirting; executives use it more in a professional context, to increase rapport with someone or win a negotiation. On the other hand, laughter may have a negative connotation, even in our own culture. There is a widely appreciated difference between “laughing with” and “laughing at” someone. Using sarcasm and scorn toward people may cast them out of a group or block their entry. Laughter then becomes an instrument of social hostility. Humor usually means trouble - preferrably for someone else. Humor and laughter can be a way to deal with surprise, incongruence, and threat. As tension mounts, along with all the stimuli that trigger the fight-or-fight response, laughter can be a release that we share with others. Some people have fits of abnormal laughter, producing an inappropriate, unrestrained, uncontrollable laughter dissociated from any stimulus. 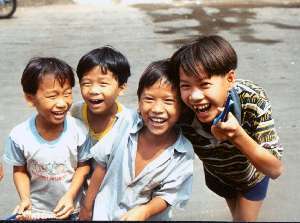 To observers, the laughter often appears childish or violent. Clinical researchers report pathological laughter in three main conditions: psychiatric illnesses such as hysteria and schizophrenia; pseudobulbar palsy (a disorder affecting the muscles that control the tongue, throat, and parts of the face); and gelastic epilepsy (a form of temporal lobe epilepsy with fits of mirthless laughter).9 Scientists believe all these conditions involve disinhibition of impulses in the higher brain stem. Although the neuroanatomy of pathological laughter is not fully known, three levels of the brain are probably involved: the cortical level, the bulbar level, and an integrative level probably at or near the hypothalamus. Patients with pathological laughter almost invariably have brain damage. Laughter may also cause neural pathology, however, leading to or aggravating some key symptom. For example, in a disease called cataplexy, characterized by sudden lack of muscle tone that leads to falls, laughter is a potent triggering stimuli. Collective contagious laughter is also pathological. One of the most extreme cases occurred in 1962 in Tanganyika. It started among young girls who erupted in fits of laughter that did not stop, spread to neighboring communities, and became so severe that schools were forced to close. The epidemic persisted for almost six months and may not have been psychological—at least not entirely—because victims had symptoms such as fever and headache. We have examined how important laughter is in our lives, how it forges social bonds, how it stems from our playful behavior as children. In this light, the trend in modern Western societies to restrict the play of children is worrying. What will be the consequences, if, indeed, play is important in developing personality and social behavior? Watching television and engaging in socially isolated, individual play with video games and electronic toys has increasingly displaced social interaction and group play. Fear of crime, illegal drugs, and automobile traffic makes many parents curtail the custom of sending children outdoors to play freely. Parents who arrive home late from work have little time to play with their children in the evenings. Schools cut into playtime to cram more classes and topics into the day; they use detention or suspension of playtime to punish pupils for misbehaving or for getting poor grades. Teaching children to compete seems to have overtaken teaching them to relax, play, and socialize. Where will all this lead? There are indications that these shifts may have some bearing on many of today’s social ills: increasing violence in schools, very young children using weapons and drugs, and social and racial intolerance. Scientists such as Panksepp speculate that the recent astounding increase in the prevalence of attention deficit hyperactivity disorder may be fueled by restrictions on play in American schools. Deprived of exercise and time to play, normal young children become fidgety; their attention spans decrease. Play and laughter not only fertilize the brain but they fertilize the human spirit. These are the types of systems that allow us to be joyous, sharing creatures that do the right things in the world—or usually do the right things. If other people are interacting with us in positive ways and we respect the way they feel and they respect the way we feel, if we read each other’s minds correctly, then I think we have a better world. And play and laughter are a big part of that.